(Nanowerk News) It set a Guinness world record. The highest resolution microscope in the world. It clearly shows features as small as 0.39 ångströms. For comparison, most atoms are about 2 to 4 ångströms in diameter. Previously, electron microscopes were limited by the electron lenses in the microscope. Now, a team based at Cornell University has combined a scanning transmission electron microscope (STEM) image reconstruction method with a new type of pixelated electron detector to obtain the highest resolution images ever seen (Nature, "Electron ptychography of 2D materials to deep sub-ångström resolution"). Electron microscopy is a fundamental tool used to understand many types of materials. The better the image resolution (the smallest features that can be imaged), the more information can be extracted. Until now, the resolution limit at energies that can safely image ultra-thin samples has been about an ångström. Since this is also about the size of a typical atom, atoms appear as fuzzy balls in the images. The new method is more than a factor of two better in resolution and offers sharp atomic details. The method provides a clear path to even higher resolution imaging. For electron microscopes, the traditional approaches to improving resolution are increasing the energy of the electron beam, up to a point where the sample begins to be damaged, and adding correctors to improve the quality of the lenses. There is a limit to how much correction scientists can do if all these additional elements are to stay in alignment. 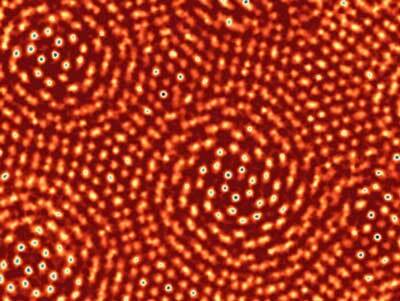 Now, researchers report the highest magnification image ever obtained with a transmission electron microscope. They generated the image by passing electrons through a molybdenum disulfide sample to produce two-dimensional diffraction patterns and then using computer algorithms, packed with indirect scattering data, to produce the image. The image reveals the molybdenum and sulfur atoms with a resolution of 0.39 ångströms. Researchers believe the technique could lead to ultra-precise data about atoms in thin sheets. Further, it could lead to a way to obtain images of the bonds between every single atom without destroying the sample.